Thibaut Courtois - Absence from training says it all really. Thibaut Courtois has decided to take matters into his own hands as far as forcing his way out of Chelsea by refusing to report for training. It's a disgrace and shows the complete lack of respect for what our club has done for him. It was Chelsea that spotted his talent and signed him for £8m when he was 19 in 2011. It was Chelsea that agreed to loan him to Atletico Madrid for three years which gave him a platform to impress. It was Chelsea that decided to bring him back here, to oust our legendary goalkeeper Petr Cech who had played a HUGE part in the most successful period in our history. It was Chelsea who have given him an even bigger platform in England with Premier League, FA Cup and League Cup trophies confirming his status as one of the top three goalkeepers in the world. How does he repay that faith in his talent and the belief in his ability? By going on strike to force a deal through to Real Madrid which is due to be completed in the next 24-32 hours! It's a shocking disgrace and shows what type of person he is in my opinion. OK, I understand that he wants to be near his children who live with his Ex in Madrid, that is not the issue here, its how he has decided to handle things. Take Eden Hazard for example, he had made a suggestion that he wanted to leave to go to Real Madrid, Chelsea made their stance clear in that they did not want to lose him and so if they had to, they wanted what they felt as a club was the right valuation in £200m. Real Madrid decided that was not acceptable and pulled out of the race to sign him. Hazard has reported back to training and by all accounts has said that he accepts the clubs stance and is preparing for the new season with Chelsea. That right there is a true professional and not this clown in goal. I have to say, I disagree with the view that Courtois is touted as being one of the top three goalkeepers in the world because he isn't consistent enough. He still makes mistakes, he still concedes goals in which you look at again and think surely he could have done much better there. He may be top five but in my view not top three. 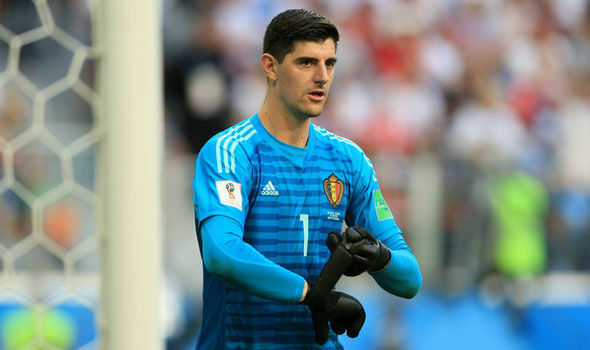 There is talk this morning that Courtois will sign for Real Madrid for £35m on a six-year deal either today/tomorrow and I think we have all reached a point now that we say good riddance. I am sick of him always stoking fires with the press whenever he stepped away from the club by talking of his future leaving Chelsea. You can only state that you have been misquoted for a period of time because when the same thing happens over and over again you realise that there is real substance in the story. As Maurizio Sarri has stated in the last 48 hours, he only wants players who are motivated to be here. Thibaut Courtois isn't one of them and his complete lack of respect for our football club is scandalous. Despite what he has won at the club, he will never be welcome back here.